Hi there and welcome to our amazing Video Gamer Blog Hop! Do you like to game? Well if so, you are in for a REAL Treat!! If you arrived at this "level" that means you must have successfully completed the last one, otherwise, you will need to RESET and start at the beginning with Michelle. As any video gamer knows, you can only complete the game by beating all levels to eventually get to the Boss level. Our blog hop today is set up on that 'idea', with each stop being a level to complete. To COMPLETE this level, here is all you need to do! 2- COMMENT on this blog post, letting the owner know how much you enjoyed the project they shared with you today! 3- Go to the NEXT LEVEL once you have completed these steps! I had to do Bowser!! I named my cat Bowser after this Bowser!! Here is a close up. The sentiment is from Jaded Blossom's Villain Candies and I used the circle die from Spring Dies. Holy wow your stuff is AMAZING!!! Awesome Cards and project Candace! Wow - love all that attention to detail. Oh just amazing, thanks for sharing. omg everyone did an awesome job!!! I just can't with all this cuteness. My son is going to freak when he sees this Bowser, his favorite character!!! And that is the cutest princess ever. Great job. I just love these! Great job Candace! Both projects are amazing! What a fun and exciting blog hop! This was such a fun hop and I love both your projects!! They both turned out so cute!! Bowser and Princess Peach are both so adorable. Seriously loved all the projects in the HOP. So great!! Love it, such attention to detail. awww the best for last, great job! 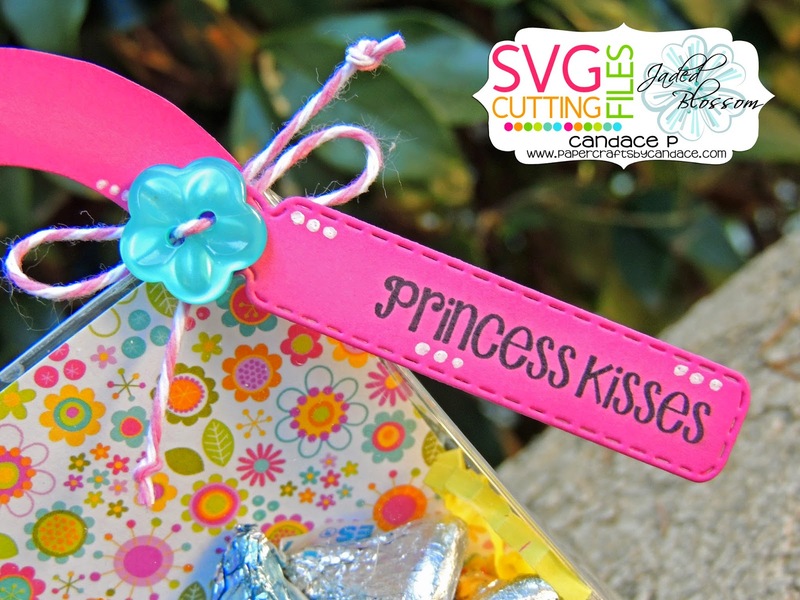 LOVE the Princess cute box!!!!! ADORABLE!!!! Your Bowser and Princess Peach are just adorable. 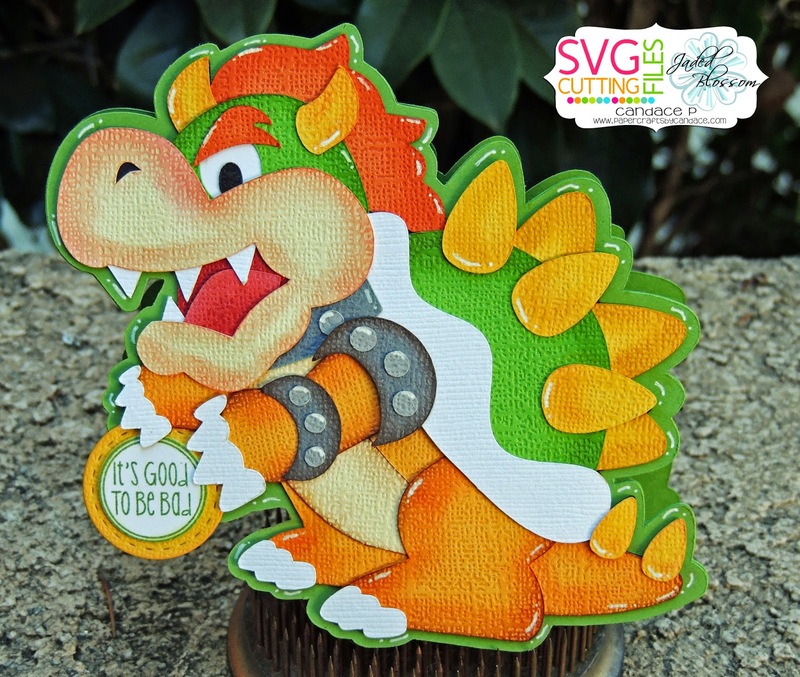 Loved the textured card stock used on Bowser, it just made it more real :D Thank you! I love this/) you guys are just awesome!!!! Bowser looks so much like that stuffed animal. YOu have done a good job. I love it. Oh Candace - your Bowser is so awesome!! What a fantastic project and this hop has been wonderful. It's only my second one and I have enjoyed it so much. I'm not a fan of Princess Peach because I think she is a bit silly - she always gets kidnapped right after Mario has saved her - but you have made her look so adorable I have forgiven her!! Thank you so much for the wonderful hop!! Aww, Bowser & Princess Peach both bring back lots of memories of my childhood. Thank you for doing this themed hop. It was a lot of fun & I really enjoyed seeing everyone's creative projects. Holy moly! Bowser is bad a$$! 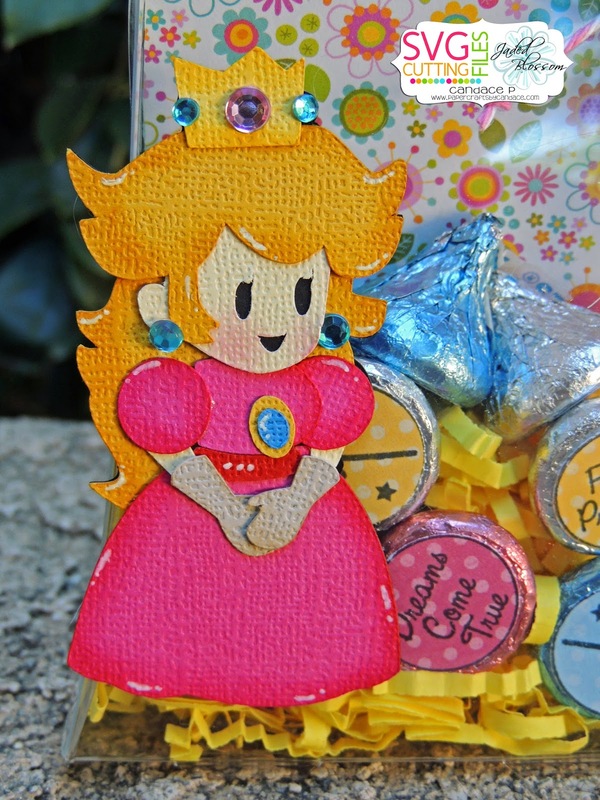 Princess Peach is super cute! She looks just like the Super Mario Paper version game! Hats off to you ladies for another fantabulous hop! Fantastic creations all over this game hop! Wow! These are all great creations! It is good to be bad..great project. EKEEEEKKKKK! Its PEACH!!!!! WAHOOOOO!!! And Bowser is AMAZINGLY done Candace!!! SO life like!!!! Great job!!!! Whoa! Your projects are beyond awesome! The details are phenomenal. Love the Bowser and Princess Peach. I sooo loved this blog hop. It has been so much fun looking at all the wonderful projects and going back in time to the older video games! Super cute! I love the Bowser! OH WOW! I need Peach!!! Bowser looks awesome!!! Your Bowser is INSANE! Your shading is just perfect, and the sentiment is awesome! 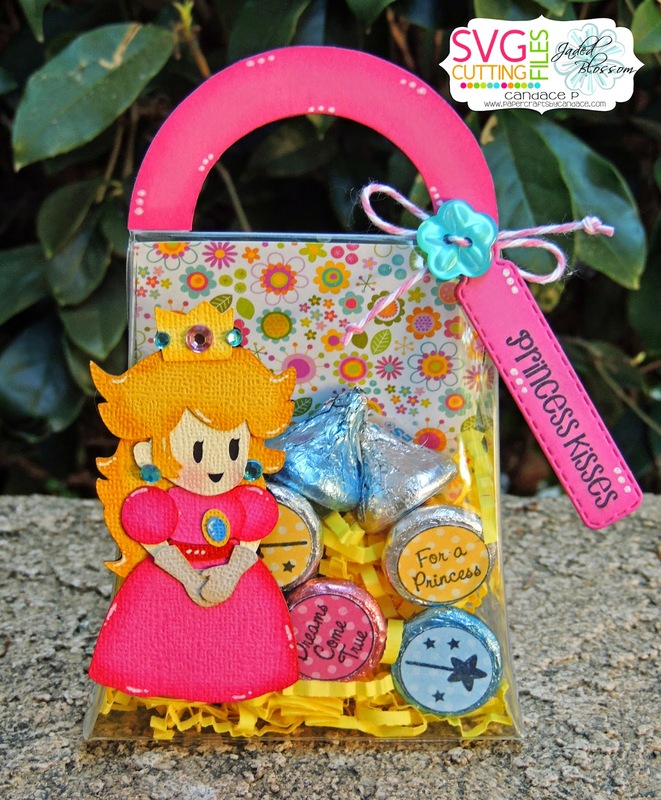 Princess Peach is so perfectly pink, and that little gift bag is adorable. I'm sure Mario (or Luigi!) would appreciate all those kisses lol Well done! wow your shading is amazing!!! Awesome job on both projects. Bowser and Princess Peach are super cute. This was a fabulous hop. So much fun! You girls did so well. I am proud just to be able to "Hop" along with such talent. so stinking funny... PEACH IS SAVED>.whoo hooo... love your Bowser...it is amazing with all those details...and Peach... well.. so glad we found her at the end! awesome as always!! Oh my goodness another awesome hop. Love, love, love that Bowser card. Great job on the details. Your projects are just brilliant. This hop is amazing! OMG! I hated seeing Bowser in the game because it meant I was going to die. I did not get any video game skill. This one is so cute though. Love Princess Peach. With 4 granddaughters she'll come in handy. Love both of your projects! This hop has been awesome! Looks like they saved the best for last. Love your colors for Bowser and great chalking. Bowser and Princess Peach!!! Both are awesome! Beautiful, awesome, cute projects. Love your projects. lol love that you did the princess and king Coopa! Amazing job. Amazing hop! Such a great job. My daughter love Princess Peach. Your princess is cute but your Bowser rocks. Fabulous. I love both projects! The Bowser card is so cool. Bowser and the princess, both projects are great. The game theme is too cute! reminds me of a time when I could actually play the games. Love the work ladies, Keep it up! So sweet! I love them both. bowser and princess peach are awesome. great projects. they are totally cute! These are both just fantastic! Love them! Great cuts and a great hop! WHAT a fantastic hop. This made my day and well done DT! this was a great hop!!!!! love the bowser you did and princess peach is always a favorite! loved the bowser card!! and princess Peach!!! WOW you ladies did a great hop as always I love how you make the most irresistible files. Bowser is awesome!! Love them both! You girls all did such a super job! Happy I beat the game ;)Great boss and beautiful princess!! LOVE both of your projects, but absolutely ADORE Bowser!! Awesome! My goodness… these are adorable!!! I want them!! Absolutely AMAZING project Candace! Bowser turned out so super cool! The shading on him is awesome! The Peach gift bag is super cute too! Awesome job on both the cards. TFS! The detailed shading on these are awesome, very well executed. These are seriously amazing. Loved the hop! Thank you to all! oh my! love Bowser!! he looks great! but where is the pic of Bowser the cat? These are so cool!! Thanks for the great hop!! One of my favorite games! Great job. So cute! Loved all the projects! Cant wait to make some! Thanks for sharing! I LOVE the colors you used on these projects!!! They are so cute!! Love your card and treat bag. Nothing feels more complete than beating Bowser and getting Peach back. well, I never got as far as to save the princess.....But, these are super cute files! love them! Leaving the best for last! Bowser!!!! Awesome! Wouldn't be complete without Bowser and Princess Peach!!!! Love both your projects! Love the princess bling! OMG cute projects. Love it. Great job on Bowser! Awesome hop! Great job! but I hope your cat doesn't look like him. LOL Loved the blog hop! love everything candace! you did an amazing job! I had so much fun with this blog hop!! You ladies are so talented!! I love your work!! Bowser and Princess Peach with a the attention to detail is awesome!! thanks for always having these hops available. You did a fantastic job on Bowser and Princess Peach! OMG Candace!! Your Bowser card is to die for!! And that Princess is perfect too!! Love them!! Princess Peach has been rescued!!! I Love it!!!! This hop has been fantastic! Bowser and Peach are a perfect ending. Great projects! Thank you!!! Bowser is so awesome! Love the colors, they really popped. great projects and incredible inking on them! Our dog's name is Princess, but hubby always calls her Princess Peach - love the file! Love it!! Thank you for sharing! Bowser AND peach! this is SO awesome. you are amazing! I had to show my son these! he is IN LOVE! All ofyou ladies inspire me!! You are very talented!!!! :) Again, such great talent and so many great projects! You guys are great!! Awesome projects from all of you talented gals. Thanks for another wonderful hop. Love it! My favorite blog hop so far!! I love the details on your characters. Amazing work and thank you. This is awesome! I love your characters! Love the special touches you gave your projects....the details really show and make your projects outstanding....over the top terrific. Love Bowser and Princess Peach!! They are so colorful and full of fun!! Great hop with big thanks to SVG Cutting Files and Jaded Blossoms for designing all. Well you can't get any more perfect than that dragon..WOW!!! Love your princess too! AWESOME!!! Loved the hop (my first) Great Job on the characters! Oh my such beautiful work!! Thank you for your blog hops!! love your projects! Thanks for sharing these great ideas! OMG!! These are just so fabulous! perfect project to end the blog hop.. Love it.. OMG!!! Bowser and Princess Peach are perfect!!! SO much detail in both!!! Love love love!!! I think this is one of my favorite hops!!! 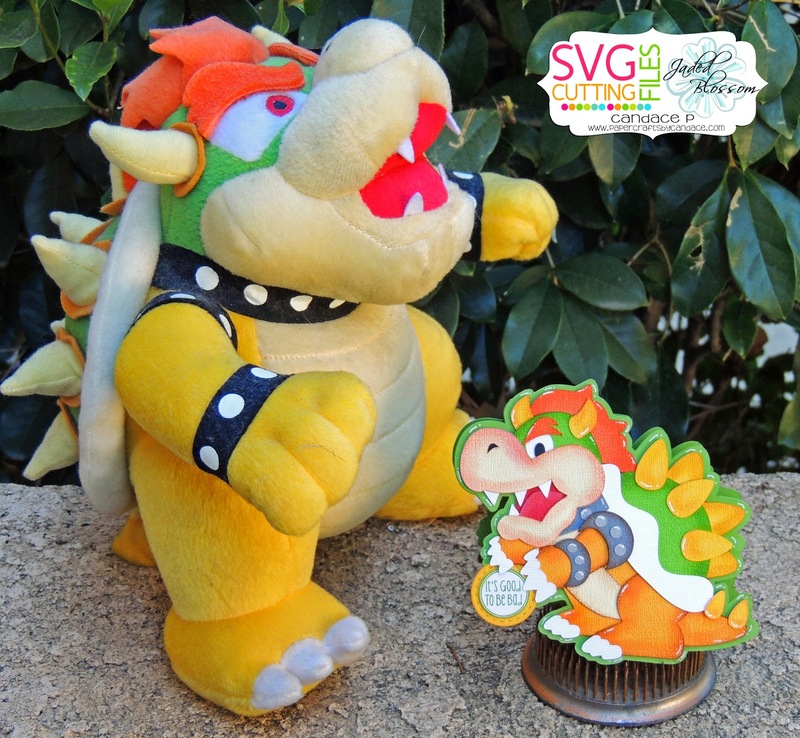 Awesome projects and Bowser looks fab. This was an awesome hop, loved it! Oh My LoVe, LoVe these!! 2 AMAZING projects!!! :) Your creations look just like the characters!!!!!! super cute project, love it!! Bowser is so hard to get by, you did an outstanding job on him and Princess Peach! Maybe some day I'll figure out how to save her...LOL!